(Vero Beach, Fla. – January 19, 2019) Indian River Community Foundation awarded grants totaling $250,000 to nonprofit charitable organizations serving Indian River County. The grants were awarded from the Community Enrichment Fund. One of the grants was awarded for $100,000 to McKee Botanical Gardens. It will support the construction of the Children’s Garden at McKee. “Wow,” said Sandra Rennick, attorney with Gould Cooksey Fennell and chair of the organization’s Board of Directors. “We are so excited and very grateful for the Community Foundation’s support.” Once completed, the Children’s Garden will be a unique destination that will provide education, enjoyment and enrichment to children ages three through nine years old and their families. Another grant was awarded for $100,000 to Gifford Youth Achievement Center to support the construction of a facility expansion. Once completed, this expansion will increase the organization’s capacity to serve a total of 300 youth per day. The final grant of $50,000 was awarded to the Laura Riding Jackson Foundation. 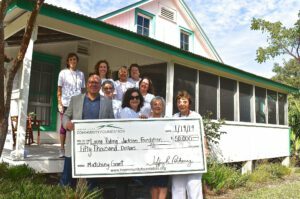 With this grant, the Community Foundation will match contributions totaling $50,000 made by June 30, 2019, toward the cost of relocating the poet Laura Riding Jackson’s historic home from the campus of the Environmental Learning Center to the Mueller Campus of Indian River State College in Vero Beach. While most of the Community Foundation’s grants are awarded by clients through donor advised funds, Indian River Community Foundation’s competitive grant program is made possible through the generosity of anonymous donors to several grantmaking funds, including the Community Enrichment Fund. These valuable resources support the Community Foundation’s mission of building a better community through donor-driven philanthropy. Indian River Community Foundation was established in 2008 with a mission of building a better community through donor-driven philanthropy. With assets of almost $50 million in 165 charitable giving accounts, the Community Foundation and its clients have awarded more than $55 million in grants, mostly to nonprofit charitable organizations located in Indian River County, Florida. Visit www.ircommunityfoundation.org to learn more.